Plovdiv has many faces – the green hills on a sunny day, the cobbled streets on a rainy afternoon, the narrow snowy alleys during wintertime. Plovdiv is love – the warmth of a Christmas candle, cinnamon rolls, the smell of chimney smoke and a mug of hot tea. In one word – Plovdiv is art. 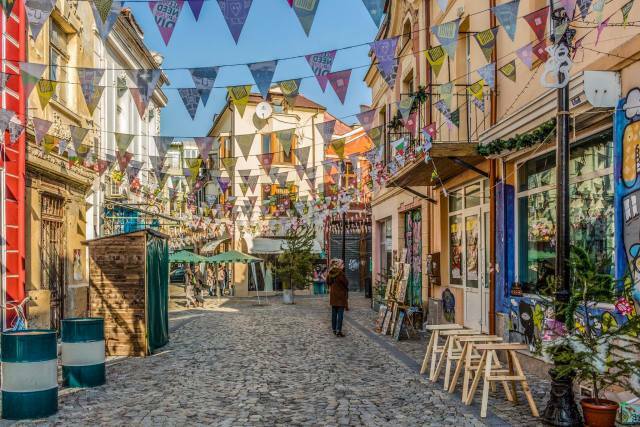 We love Plovdiv and we love its art and we are asking you- is there a better place to enjoy it and spend some quality time than Kapana, the creative district of our city? In April last year, we started the Kapana tour. We wanted to show people more about the history of the neighbourhood, its residents, their stories, everyday life and habits. But since then many things have changed – Kapana grew, many new artisans and craftsmen made it even more colorful. As we always want to get better and improve our projects, we decided that it was high time for Kapana Tour to grow up as well. And so – we are happy to announce that after some changes we made, you can now, in every sense of the word experience what the Kapana neighbourhood is by visiting our upgraded project Kapana Arts and Crafts District Tour. How to join Kapana Arts & Crafts District Tour? By joining us you will get the chance to submerge into the stories from this fascinating neighbourhood. You will have the chance to learn about its inhabitants and their crafts, visit a local contemporary art gallery, see a few workshops, and who knows – at the end of the day you might be introduced to the secrets of a local craft and learn it for yourself. Kapana tour now starts every Saturday and Sunday, at 11 AM from May to September and at 2 PM from October tо April at the Municipality Building of Plovdiv (the Town Hall). It takes around two hours and the price of the ticket is 9 EUR (18 BGN) per person. You can book via Viator or show up at the meeting point without reservation. You can get more information and discounts for the Kapana Arts and Crafts District Tour (link to Facebook page) if you join the Free Plovdiv Tour first!